I was staring at a huge mass of … something. There was a dirty red rag, a heap of twigs, a blackish piece of lint amongst the twigs, and two gigantic, ponderous birds. The birds were vultures, and they were working at making something — a shapeless mass which eventually became a nest, on a huge tree I used to watch in Central Delhi’s Hailey road every day. As the year passed, the nest — untidy, large and looking like the bed of a distracted teenager — became home to a chick. The chick was always vociferously hungry, the parents appearing bedraggled but devoted. The chick fledged eventually, becoming large and serious-looking, and that vision remained the last vulture family I saw in Delhi. 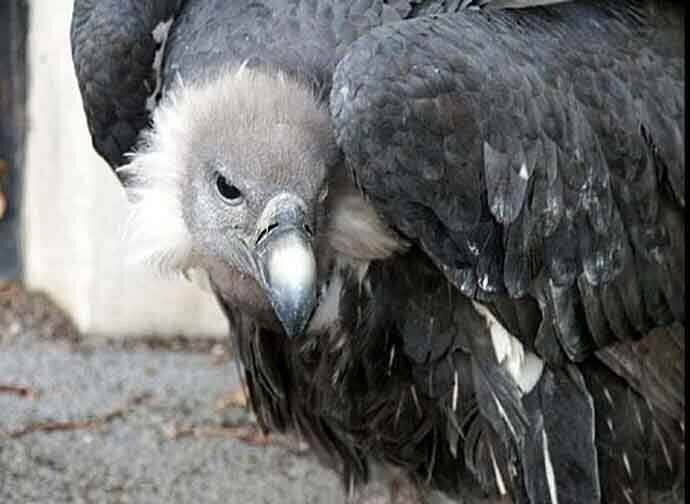 Soon after, India had a 99 per cent crash in Gyps vulture populations, due to the use of a cattle drug which is poisonous for vultures. Conversations with others about the vulture family were laced with disbelief. Some thought the ubiquitous, much-smaller Black Kites were vultures. Others, never having seen a vulture, denied the fact that the bird could indeed exist in posh Central Delhi. The fact though was that I couldn’t have witnessed this piece of history if I hadn’t noticed the tree. A tree, which is so many things. A tree situates a place, gives protective cover, helps weave memories, and even holds metaphysical vultures. Some trees from that time of the vultures remain in Delhi, others have been chopped down with a speed that belied their size and presence. And trees are under threat in every major city. It’s fitting then that across cities, people are coming together not just to protect trees, but also document them — mapping both the tree, as well as what it means to the individual. Environmentalist Siddharth Agarwal started the #fiftytrees hashtag on twitter to kickstart this process. “#FiftyTrees tries to get people from different geographies to participate in a common exercise, but the actual value is in what’s happening off Twitter. In essence, the exercise requires us city folks to stop and notice the trees around us that we otherwise often miss. In a world full of advertisements, where ads occupy most visual and mind space to sell us things we don’t need, it is only appropriate that we try and see things that sustain us,” Agarwal says. 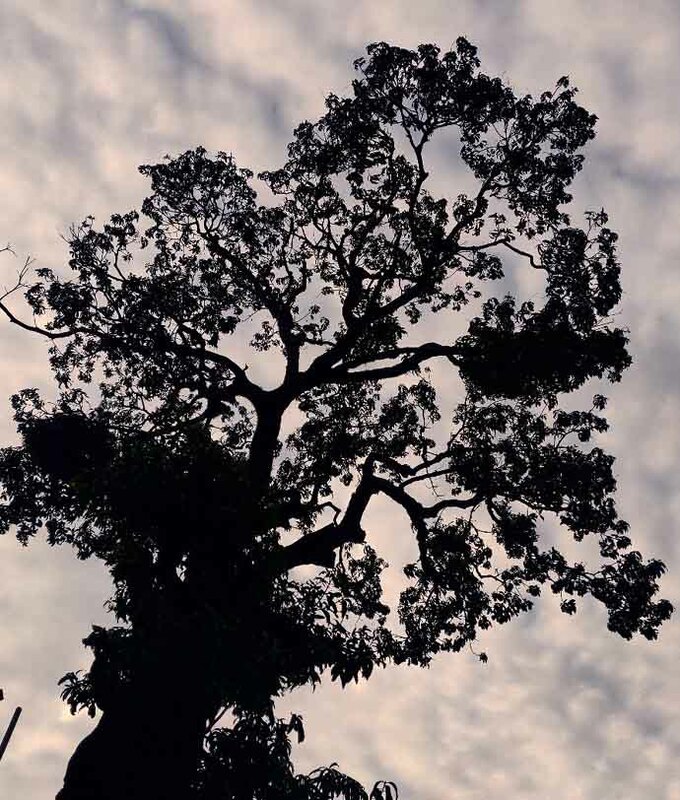 Agarwal himself has started a fifty trees thread for Kolkata. Amongst the trees he has listed are an old Banyan on Netaji Subhash Road, an almond tree with a burgundy, heart-shaped open shell along Subhas Sarovar lake, and a Copper Pod tree, (a beautiful tree with yellow flowers, and seed pods which are a burnished copper colour) along the banks of the Hooghly. Ecologist Vallari Sheel, is doing a #fiftytrees thread for Delhi. 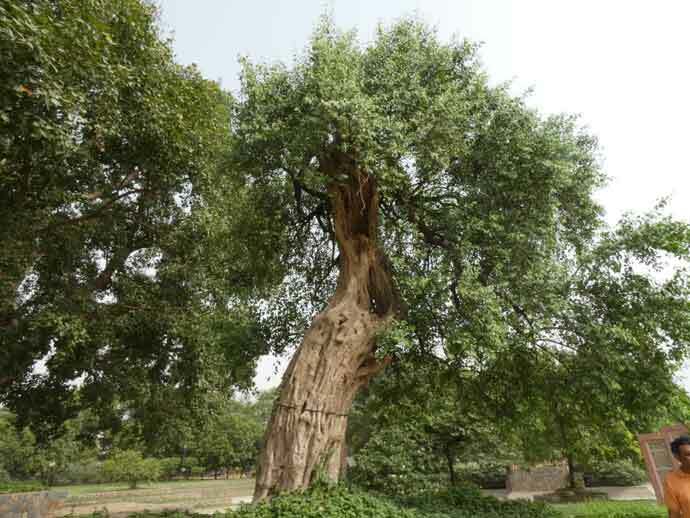 She points out an old, monumental Pilkhan (a ficus species, similar to a Peepal tree) in Hauz Khas Deer park. She also maps a huge Peelu tree “dancing, Tribhangi pose” with a wrinkled, gnarled trunk, in the iconic Sundar nursery. 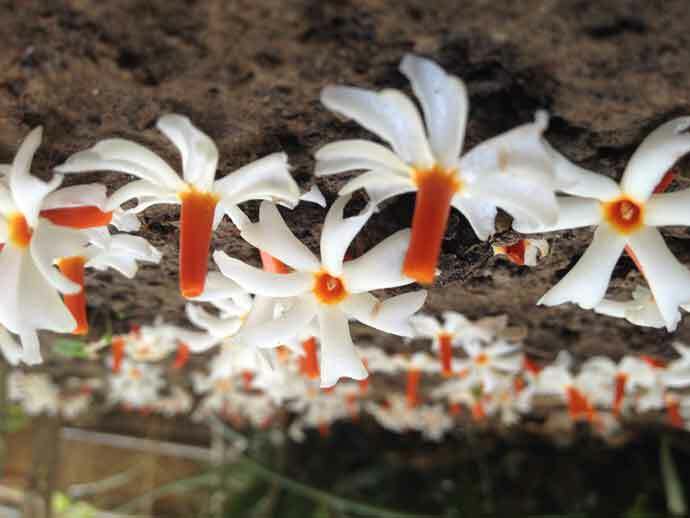 But with climate change, flowering patterns have changed. “The tree, sadly, died a few years back, and this time I took it upon myself to plant three of them all around our house. Over the last few years, we have noticed how erratic the flowering has become; it no longer seems to be at the same time every year. 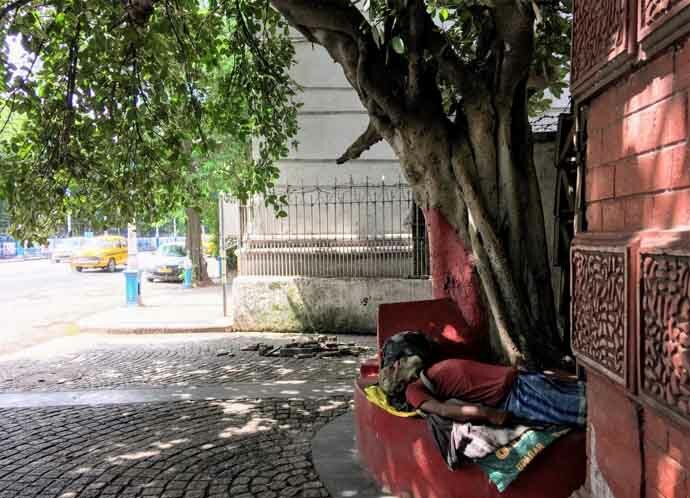 In Mumbai, twitter user Mumbai Paused highlights trees in the city that act like balm in the crowded city’s existence — trees in a cemetarynear Dharavi and mangroves surviving anyhow next to a crowded road. Sarda Mohan notices a magical cannonball tree — a tree with blossoms like cannonballs—near Powai, Mumbai. In Cochin, Pins (@acomicinsane) points out the little things: a custard apple tree next to a bakery, a mango tree against the sunset, in a church compound on Pandit Karuppan road. Like the church, places with religious and architectural heritage certainly are hotspots for old, magnificent trees. Syed Mohammed Qasim, for instance, documents a historic Peelu tree at the Dargah of Hazrat Sheikh Hasan Tahir in Delhi. It’s abundantly clear that many beautiful trees exist in the most unlikely places. They are adored and photographed, but ever so often, they go unnoticed in the battlegrounds of the city. Each square centimetre of land is real estate, even in urban commons like roadsides. 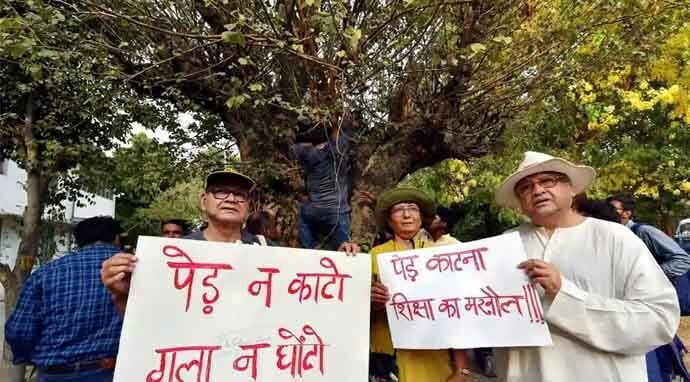 While Delhi is in the news for massive protests to save the city’s trees, other protests to save trees are also ongoing in other locations. Cases have been filed for tree-cutting in Noida’s Sector 91, while others in Tamil Nadu are fighting against the Salem-Chennai highway expansionwhich would acquire farmer’s land and cut thousands of trees. Perhaps what we really need are millions of #fiftytrees maps. Maps of the heart, leading to maps of the future.